Several years back my husband Michael and I faced what could have become pretty scary circumstances. He was going up for tenure as a college professor, which most in the world of academia know can be filled with uncertainty. It was 2008, the year the economy tanked. He’d sent out over a dozen applications for jobs at other colleges and universities in case his tenure was denied, but many of those institutions collapsed their searches due to lack of resources. We knew there was a real possibility that he’d find himself without a job in a time of serious economic uncertainty. We also understood that, if that were to happen, our disabled son’s preexisting conditions could render him uninsurable or, at the very least, burden us with huge premiums and lifetime caps. In addition, the costs of Calvin’s medical care, (his antiepileptic drugs and other prescriptions alone totaling thousands of dollars per month), could easily have ruined us. Thankfully, Michael was awarded tenure and we dodged that bullet. Recently, I’ve been reading and hearing about the poor people who will be left without affordable health care insurance. Currently, 26 states—all with Republican governors or Republican-controlled legislatures—have thus far declined Medicaid expansion, something not intended in the original drafting of the health care law. 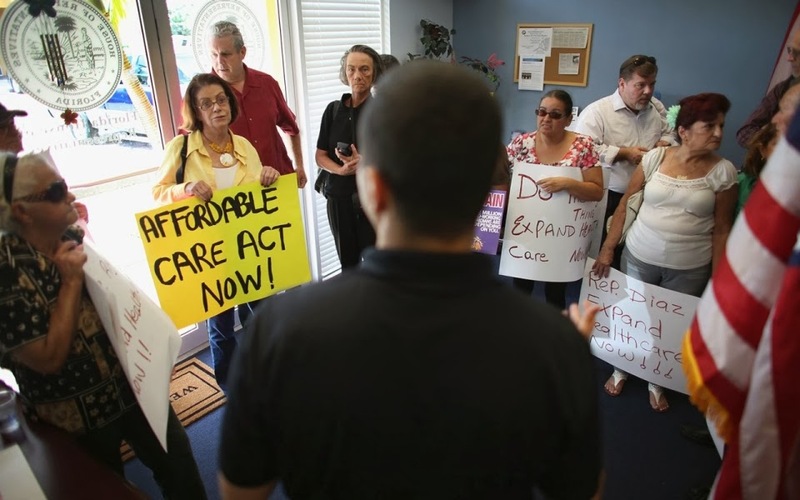 But, under a U.S. Supreme Court ruling on the Affordable Care Act (aka Obamacare) in June 2012, the federal government was barred from mandating states to enact Medicaid expansions. As a result, an insurance coverage gap currently exists where millions of people making less than $11,500 per year ($23,500 for a family of four) will have too much income to qualify for Medicaid but not enough to receive federal subsidies when purchasing insurance on a state-run health exchange. This leaves the health care situation of millions of uninsured people unchanged, including a disproportionate 60 percent of the uninsured working poor and 68 percent of uninsured African-Americans and single mothers. Down and out and uninsured in the land of milk and honey? I wonder if these governors and legislators would be up for trading places with some of their disenfranchised millions, if only for a day. Our culture in the US has somehow moved away from the ethic of helping others--we're all in this together--to glorifying individualism. This underlying belief, this way of thinking, has resulted in millions of people suffering, and any attempt to help them is met with the argument that it will raise "my" taxes. A good social support system accounts for Denmark being the happiest country in the world, we are told, and every other developed country has at least a universal health care system, but we in the US continue to hang onto the conviction that everyone should stand alone...do it by our own strength...be responsible for yourself, not your neighbor.....yatata yatata. Until our people begin to see what our way of thinking has caused, and decide to change, we will never be a happy country...will never see an end to these problems.